Lazy is a real mini site of ten hectares and only 15 pitches (ten with 4/6A electricity). This means pitches are up to 300 sq.m. or more and there are panoramic views over the sloping countryside. Pitches are off one meandering, gravel access lane, some with shade to the back. Lazy is a working farm, more or less in the middle of nowhere. This makes it ideal for nature lovers (deer may be seen by day or night), with several marked and unmarked walking routes available. A great site for exploring the Slovakian countryside. Activities on site include goat milking, fishing and camp fires. Close to the site are several UNESCO World Heritage sites, like the Banska Stiavnica mining town and the wooden church in Hronsek. Good, clean toilet block with washbasins and hot showers. Two complete bathrooms. Laundry facilities. Fridge. Drinks available. Lovely pool. Walking routes available. Campsite app with all tourist information available. 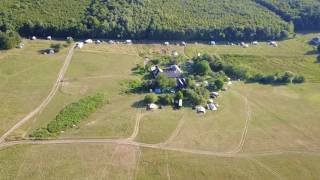 The campsite is easy to access from the road which connects the village Suchan and Cebovce. Follow the yellow/black signs wit Camping Lazy.